I read this Union Leader editorial today on civil unions. I posted a comment of my own on the story, but I dunno if they’ll publish it. I doubt they will. So read the article and pretend it has this at the bottom. “Another square-wheeled Union Leader editorial that comes off about as progressive and foreward thinking as the Third Reich. Every week its the same thing, and it never deviates: fear of change. Why do I even live here? This place is absolutely beautiful, but each passing day I find I have less and less in common with this state. Every time NH seeks to climb off the bottom rung on the ladder of social evolution, somebody starts screaming about their rights being taken away. I’m surprised we are even permitted to have a state flag that doesn’t bear a portrait of John Stark himself. 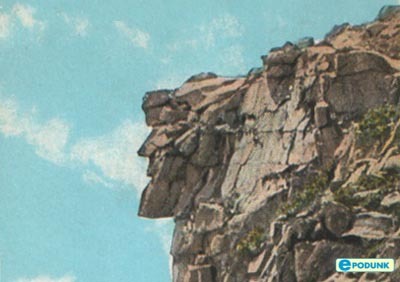 Why we haven’t already blasted his likeness into the side of Franconia Notch remains a mystery to me. Amen….I am a devout follower of the Plum gospel. I have to agree with the big guy here. Well we all know that the union leader has never exactly been a source of progressive thought in this state. Ever since that psycho Nancy Loeb, the editorialists of this rag certainly have not represented the state well. Actually, now that I think of it, the majority of this state’s residents are old or uneducated nascar watching budweiser swilling cigarette smoking outliers in the murky backwaters and trailer parks of new hampshire. Both of these groups generally share a fairly conservative view point, but honestly, how relevant are they? The politics of NH are slowly shifting, but with our rocky soil, thick vegetation and isolationist tendencies, it will take dynamite to blast these folks out of our state. Yes, this is a call to revolution, lace up your jack boots and join the ranks of the SCHWINESTURMERS*! *SCHWINESTURMER and it’s subsidiaries claim no affiliation with the Third Reich.